Art and celebrity meet, again, in this exhibition, under the guise of modernity. Actually, there is nothing more modern than celebrity, is there? 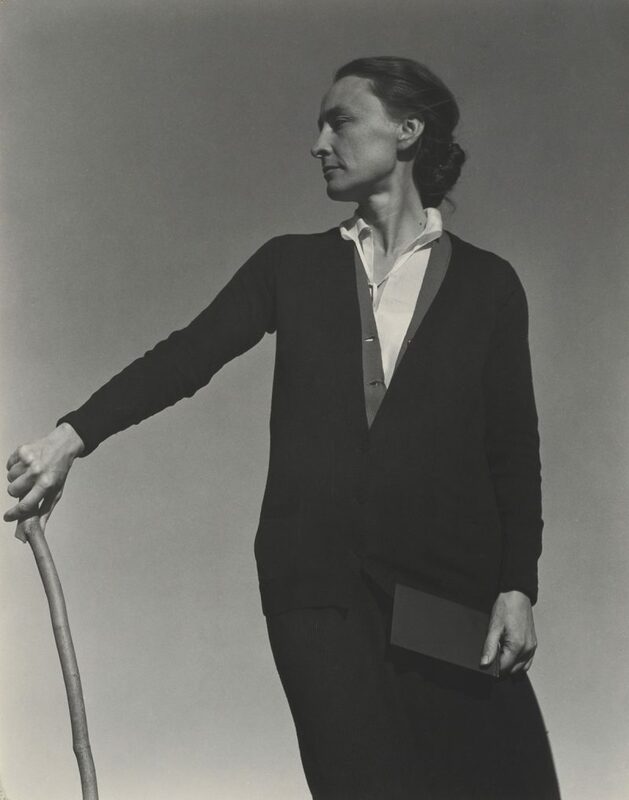 The stated purpose of this exhibition is to show how “[Georgia] O’Keeffe integrated the modernity of her art and her life.” The exhibition introduction goes on to explain that O’Keefe took great care in the way she was photographed. We’re treated to a number of photographs of O’Keeffe, as well as several newspaper, magazine, and television pieces. Viewers are also treated with a chance to gaze upon some of her actual clothes (lots of black, but not all black), as well as a survey of her painting career. For me, the paintings are the highlight of the exhibition, and the reason to attend. Any excuse to experience in person Georgia O’Keeffe’s incredible achievements must not be missed. Born in St. Paul, Minnesota, in 1887, she pursued an education in art until she could no longer afford it. She then found employment as an illustrator. From O’Keeffe’s work in this period, I especially loved a piece for Vanity Fair in November, 1916: Now that the Ball Is Over, the New York Debutante Retires to Her Matronly Couch. When illustration couldn’t pay the bills, O’Keeffe taught, in Virginia, South Carolina, and at the “Normal” school on the Texas Panhandle. In 1918, at the invitation of Alfred Stieglitz, O’Keeffe move to New York, where she would remain for the next thirty years, with occasional trips to Lake George (see Pool in the Woods, Lake George (1932)) and other Northeastern points. O’Keeffe and Stieglitz married in 1924, after Stieglitz divorced his previous wife. Stieglitz would ultimately prove incapable of remaining faithful to O’Keeffe, as with his previous wives and lovers. Stieglitz died in 1946; O’Keeffe moved permanently to her famous New Mexico “Ghost Ranch” in 1949. Among the earliest paintings in the exhibition are Blue #1 through Blue #4, from 1916. By Black Pansy & Forget-Me-Nots (Pansy) (1926), we’re seeing remarkable insight. This seemingly banal subject, its surface ordinariness emphasized by the title, is raised to the level of genius by the fiery outburst at the flower’s center. The energy shooting out captures the life of the flower; I couldn’t take my eyes away. Line and Curve (1927) shows increasing abstraction, subtle and striking, yet, at the same time, represents a path O’Keeffe didn’t take. 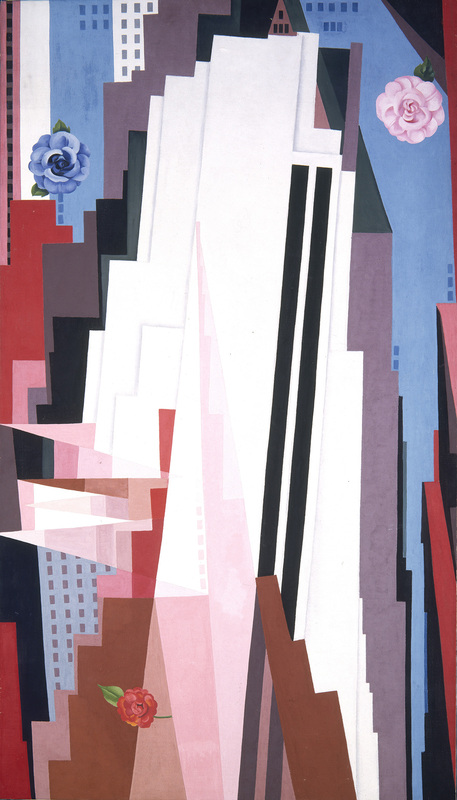 Manhattan (1932) is a striking painting, beautiful, but suggests what we all know; New York was not the right place for O’Keeffe. The painting has a little too much color; the flowers are a delightful addition, but seem oddly misplaced. 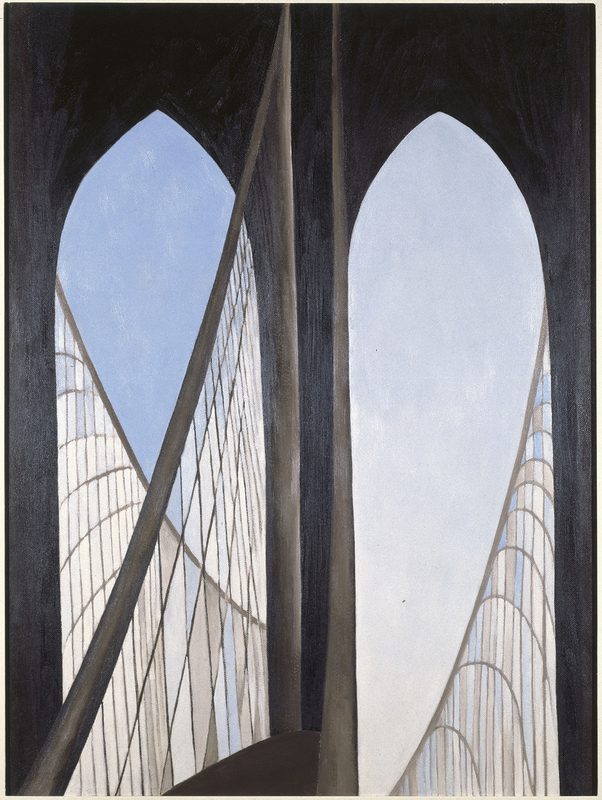 Brooklyn Bridge (1949) is the last of O’Keeffe’s works with New York as its subject. Ram’s Head, White Hollyhock, Hills (1935) is an early example of the direction O’Keeffe would take, following her permanent move to New Mexico. 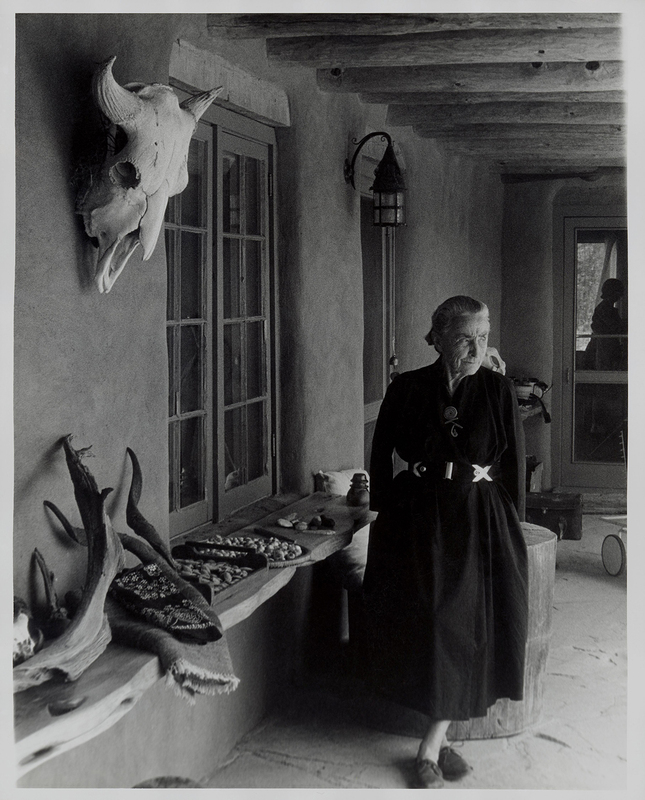 Several of the photographs of O’Keeffe from New Mexico show her collecting the dried and bleached bones of animals and livestock from the desert. 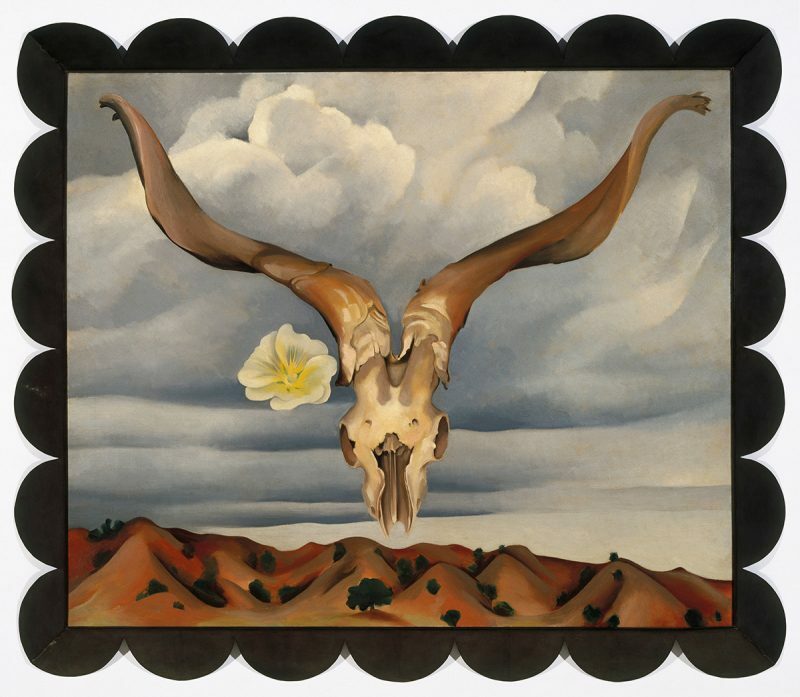 These bones, combined with the landscape of Northern New Mexico, were the raw material for many of O’Keeffe’s paintings in this period. Observe how much more natural the flower is in this painting than in Manhattan. Not that flowers aren’t welcome in New York; they just seem like a bit of an afterthought. 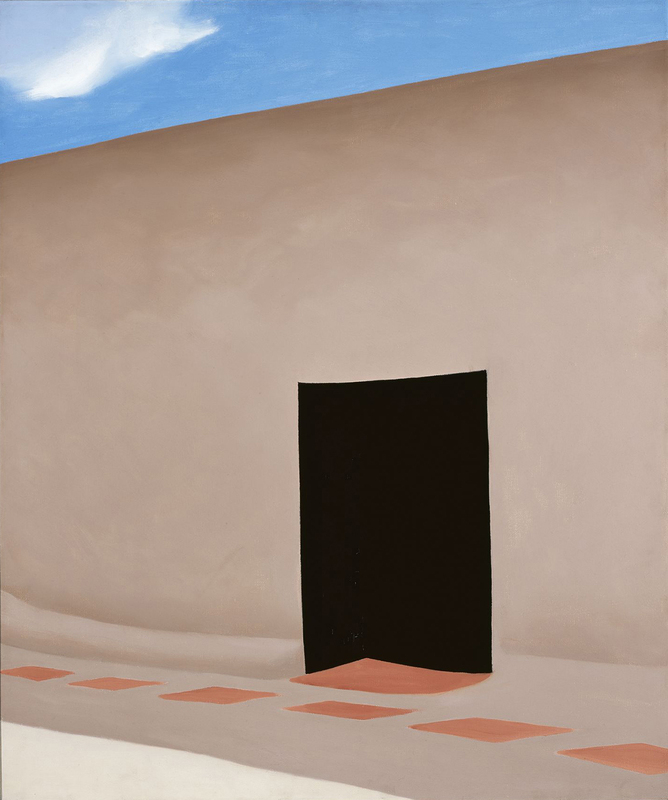 And Patio with Cloud (1956) is one of those paintings that are so beautiful that, after a few moments, it’s difficult to continue looking. As noted above, a significant part of the exhibition is devoted to contemporary coverage of O’Keeffe. One article states, “Stieglitz made O’Keeffe famous,” and, while Stieglitz was no doubt an influence, I have to believe that it’s O’Keeffe’s work that made O’Keeffe famous. Dealing with this kind of thinking—assuredly even worse in her era— could not have been easy. 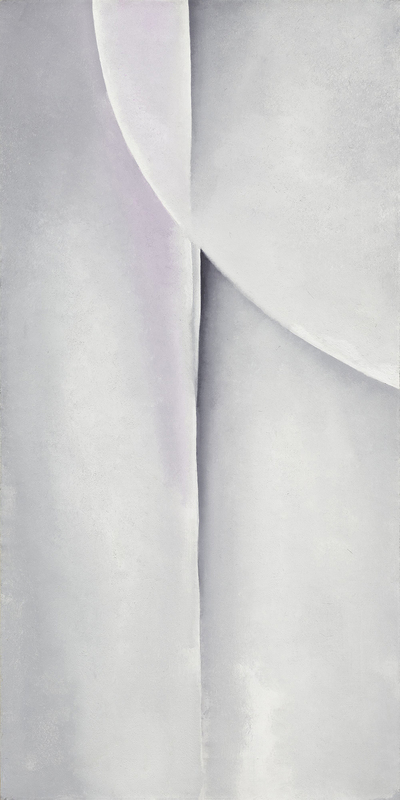 O’Keeffe did not choose to carefully cultivate her image; she had no choice but to carefully cultivate her image, and to remain distant. Very few photographs of O’Keeffe show her smiling. By the Sixties, Georgia O’Keeffe was becoming a celebrity in her own right, eclipsing the considerable fame Stieglitz had enjoyed during his lifetime. A number of celebrity photographers made the trek to Ghost Ranch to photograph O’Keeffe, including Cecil Beaton, Yousuf Karsh, Philippe Halsman, Tony Vaccaro, Todd Webb (see photograph), and Richard Avedon. By the Eighties, it seemed that everyone wanted a part of O’Keeffe. And who wouldn’t want a part, anyway? One hopes that they stayed to take in the work.